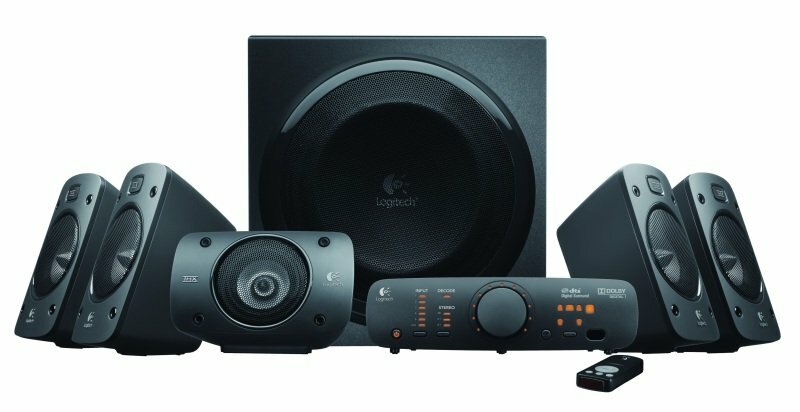 Logitech® Surround Sound Speakers Z906-hear every detail, all around you, in theatre-quality sound. 500 watts (RMS) of thunderous audio turns any night into opening night. THX® Certification gives you quality you can count on, while onboard 5.1 digital decoding immerses you in your favourite movies as you hear every detail of Dolby® Digital or DTS™ encoded soundtracks in surround sound-from the roar of the crowd to the footsteps right behind you. 1You can connect up to six components simultaneously, including your TV, Blu-ray™/DVD player, DVR, Xbox 360®, PLAYSTATION®3, Wii®, iPod® and stereo. With its easy-to-read display and easy-to-stack design, the control console fits right in with the home-entertainment setup in your living room. And a wireless remote lets you control your listening experience without ever getting off the couch. 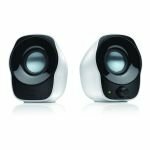 "Logitech® Surround Sound Speakers Z906-hear every detail, all around you, in theatre-quality sound. 500 watts (RMS) of thunderous audio turns any night into opening night. THX® Certification gives you quality you can count on, while onboard 5.1 digital decoding immerses you in your favourite movies as you hear every detail of Dolby® Digital or DTS™ encoded soundtracks in surround sound-from the roar of the crowd to the footsteps right behind you. You can connect up to six components simultaneously, including your TV, Blu-ray™/DVD player, DVR, Xbox 360®, PLAYSTATION®3, Wii®, iPod® and stereo. With its easy-to-read display and easy-to-stack design, the control console fits right in with the home-entertainment setup in your living room. And a wireless remote lets you control your listening experience without ever getting off the couch." • Dolby® Digital and DTS™ decoding"
• 2-year manufacturer's guarantee and full product support"